Colorado e-Bikes owners Diane and Scott Manuppella turned their enjoyment of riding e-bikes into a thriving business with sales consistently increasing 30 percent each year. In the spring of 2019, they will join other outdoor-minded businesses relocating to Las Colonias Park on the Riverfront Trail, and they have plans for a dramatic expansion of e-bike rentals. New e-bike designs are both lighter in weight and on the wallet. Options include trikes, recumbent and recumbent tandems, fat tires, cross (road to gravel), mountain, road, and folding bikes. E-bikes use an electric motor and rechargeable battery for gentle propulsion as needed. They are grouped into three classes, according to the speed and type of assistance given. The lower level of assistance used, the longer the distance per battery charge. E-bikes emit zero combustion byproducts — good news for the environment. While they are classified by state law as non-motorized vehicles (as opposed to mopeds or motorcycles), e-bike regulation varies between the classes and from city to city. 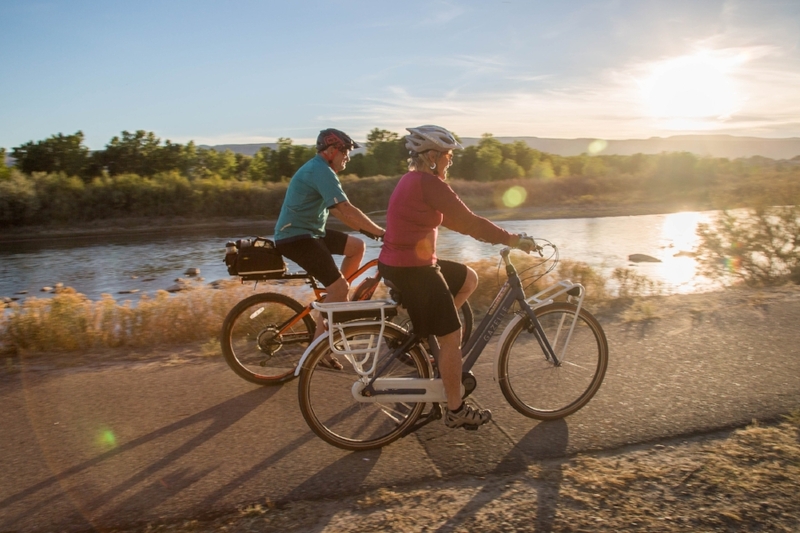 In general, in the Grand Valley e-bikes are allowed anywhere motorized riding is permitted, and along the Riverfront Trail system (with the exception of the Audubon Trail section). E-bikes can be useful therapy for those with cardiac and respiratory challenges, hip and knee replacements, prosthetics, MS, Parkinson’s, and other limitations. They are also an excellent choice for individuals with special needs. For leisure seekers, commuters, extreme mountain bikers, and those needing a little extra assistance, e-bikes are a great on- or off-road option.